Chris Kullstroem has been traveling and researching “dark-themed” events and celebrations around the world for her latest book project: Drawn to the Dark. She dropped My Scary Blog a line to share some fascinating stories and places she’s been to in the last few months. Read on for more. The journey began in September with New Orleans. For one month, I researched several themed tours based on Voodoo beliefs, vampire myths, local cemeteries and tales of the supernatural. I learned that two of the city’s tourism companies donate a portion of their cemetery tour proceeds to restoration and preservation projects of the city’s cemeteries. It was inspiring to see these tour owners understand the importance of maintaining these important aspects of the city’s culture, lest they become deteriorated beyond repair over time. However, the most memorable experience in New Orleans actually took place outside the city. I met a guide, Jennifer, who gives vampire and ghost tours in the city and owned and operated a small haunted attraction in Mississippi called “Nightmare Hollow.” During an interview with Jen, I learned that she had a very interesting method for organizing Nightmare Hollow’s crew. She invited a group of young people who had chosen to live on the streets of New Orleans to spend the weekend up at the haunt. I worked at Nightmare Hollow with Mad Max, Space Man, Voodoo and Pop Tart, and witnessed their transformation from unmotivated so-called “gutter punks” to professional actors, set designers and builders with the opportunity to use their talents and creativity that Jennifer had given them. 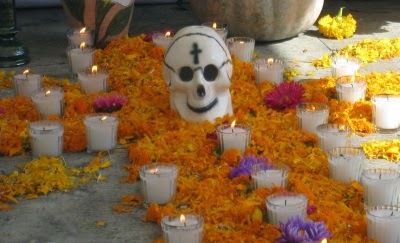 Next, I flew to Oaxaca, Mexico for their Dia de los Muertos celebrations. I witnessed countless pieces of sand art in which artists expressed their personal connections with life and death through skulls, skeletons and coffins, flowers and sunlight in brightly colored sands. With new friends I danced into the night in camparsas: lively parades in which the crowd dances with costumed Katrinas, the Mexican skeletal icon who represents the inevitability and natural process of death. Visiting Oaxaca’s cemetery, however, was what really blew my mind. I not only witnessed families sharing food, drinks and stories by gravesites, but mariachi bands also played music for the dead, stilt walker Katrinas and other costumed characters walked among the stones. Outside the cemetery gates carnival rides lit up the night with stands selling foods and drinks. 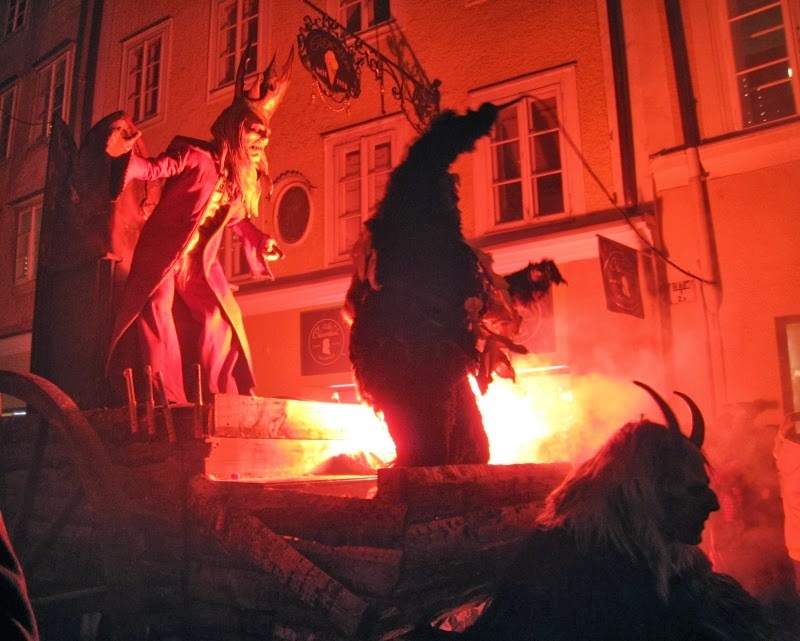 I then flew to Salzburg, Austria where I experienced several events based on Krampus: the infamous winter demon that, legend has it, accompanies Saint Nicolas on the night of December 5th. Traditionally, Krampus punishes wicked children by beating them or even stealing them while Saint Nicolas rewards the good with treats. However, in Salzburg, hordes of Krampuses take to the streets in “laufs,” or runs, in which they parade and playfully attack spectators with cow tails, horse tails or branch bundles. For one month I attended fifteen laufs in Austria and Balvaria, ranging from one to three hours and sometimes dozens of Krampus groups, or “passes.” In freezing temperatures I stood with hundreds of other Krampus fans who had come out to enjoy these free events with their friends. Chris’ travels this year will take her to Italy, Japan, China, Hungary, Germany and Singapore. Please contact her with questions or comments or for more information, visit her website www.MonstersAndBooks.com, and follow the many wonderful pictures like the ones above on her up-to-the-minute Facebook page.